This captivating silver bracelet sits with a silver chain, with a round silver charm to adjust to your perfect fit and personal style. Embellished with a row of 17 round diamond stones, this sparkling bracelet is the perfect accessory to turn a day look into night. A style staple for every sophisticated and stylish lady. 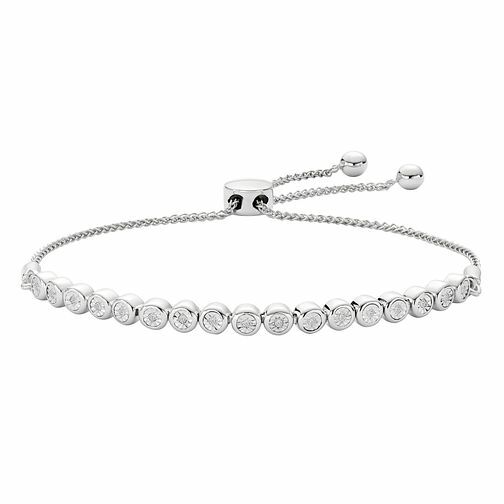 Silver Diamond Adjustable Bracelet is rated 5.0 out of 5 by 9. Rated 5 out of 5 by Anonymous from Lovely and delicate Was a bit sceptic about the product when ordered but when arrived I have to say it was lovely. Nice quality it looks very delicate but it doesn't feel like it and it is easy to wear. My daughter loves to it. Rated 5 out of 5 by Anonymous from brilliant bracelet and two fabulous rings this bracelet lives up to expectations. outstanding quality, excellent value. it would suit all age groups, beautiful to wear for special occasions or equally as an everyday piece of luxury. a perfect gift. the rings were bought as xmas gifts, classis designs, and the yellow gold makes a nice change. again, excellent value.